When Urth Caffé’s founders andowners Shallom and Jilla Berkman were planning their Santa Monica café, Jilla, primary designer for each Urth location, found inspiration in the tilework in Malibu’s historic Adamson House. Today a national historic site, California historical landmark and a California state park, the Adamson House was built in 1929 in the popular Spanish Colonial Revival style of the time. Tilework featured throughout was produced by Malibu Potteries, founded in 1926 by May Rindge, Rhoda Adamson’s mother, who discovered an abundance of buff and red clay on her property. 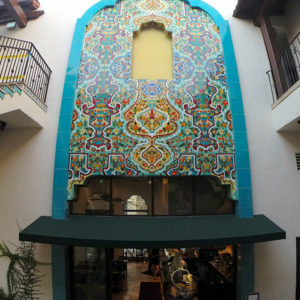 Though short-lived (closing in 1932 after a fire), Malibu Potteries’ authentic versions of Mayan, Moorish, Moroccan, Saracen and Persian tile designs continue to inspire designers today. 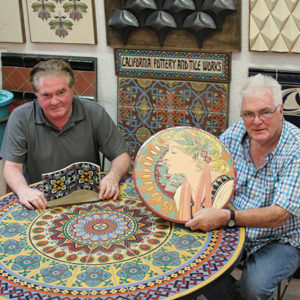 The Berkmans’ architect referred them to Desmond and Sean McLean, brother co-owners of California Pottery and Tile Works, established in 1994 to continue the rich tradition of California tile making and decoration of the early 20th century to meet the needs of today’s architectural, design and building industries. CalPot custom-made fountains and tiles were used for the Santa Monica café’s patio, and that began a creative collaboration that continues today. CalPot has created Jilla Berkman’s tile visions for each Urth Caffé, as well as for the couple’s 1917 Spanish Revival home. 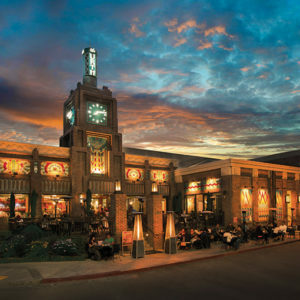 Each Urth has its signature architectural era. For example, the downtown Los Angeles café, located in a century-old building, is strongly Art Deco. The Pasadena location’s Spanish Revival design is an homage to the city’s architectural heritage with tiles sparkling with 24-karat gold glaze. Las Vegas hotel developer Steve Wynn was so awed by the Pasadena café that he invited the Berkmans to build an Urth Caffé in his new Wynn Esplanade of luxury shops. The Adamson House also inspired film producers Glenn and Debra Gainor when they started to remodel their 1925 Hollywood Hills home in its Spanish style. That led them to CalPot to create tile for the interior and exterior of the property. A big part of that “showroom” is the Gainors’ kitchen filled with CalPot custom tile on countertops, the wainscot and crown molding. CalPot’s unique ability to curve tile to fit any angle is showcased in floral border tile wrapping around corners along the edge of countertops and the farmhouse sink. “When we started talking with Sean and Des about what we liked for our kitchen, they helped us with the deco and subway tile. We chose bold, darker colors, colors of vegetables – greens, reds and yellows. And we ended up with this beautiful floral tile mural for the backsplash behind the stove,” she said.